It was nearing midnight and the sky still remained light. The only hint of sunset visible from the kitchen window was a pink smudge above the Minch, the stretch of water that separates the islands of the Outer Hebrides from the mountains of the Scottish coast. 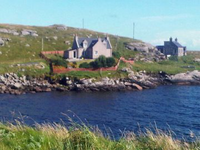 Accessible by propeller plane or ferry from mainland Britain, the Outer Hebrides are home to 26,000 people. Until I moved to New York City three years ago, I was one of them. Now I was back home – for most islanders call it home, no matter how far they travel – for my first summer since leaving. It was as beautiful as I remembered. Darkness came for only a few brief hours after midnight. During the day, buttercups glowed at the side of single track roads and wisps of bog cotton swayed in the breeze. Heather was beginning to bloom on the swathes of moorland that cover the interior of the islands. A holiday-like atmosphere filled the streets of Stornoway, the largest town in the archipelago, as locals and visitors prepared for the annual music festival, Heb Celt. But these islands aren’t known only for their beauty. In the years since I had moved away, the Outer Hebrides had been making headlines as one of the happiest places in Britain. According to the annual well-being survey published by the Office of National Statistics (ONS), respondents in the Outer Hebrides returned the highest ratings for the question “How happy did you feel yesterday?” out of any other residents in the UK. They came out in the top five in terms of life satisfaction, too. As I rediscovered old haunts and reunited with friends and family, I set out to uncover what makes Hebrideans some of the happiest people in the country. As my brother and I enjoyed an alfresco lunch at a farm-to-table takeaway on the west side of the Isle of Lewis, and then walked along the sands of Dal Mor, a favorite beach a few miles along the road, my initial thought was that it wasn’t too difficult to figure out. “Who wouldn’t feel happy here?” I thought as the sand crunched under my wellington-clad feet, the clear waters of the Atlantic lapping nearby. There’s evidence, too, that being near the water, or what is called “blue space,” can potentially make us happier – and the sea is never far away in the Outer Hebrides. On the west coast of the Isle of Harris, the water is every shade from deep navy to bright turquoise. In North and South Uist, it can feel as if it is following you as sea lochs stretch their fingers inland. And whether on a leisure cruise or a ferry trip to merely access the islands, being out on the water itself is, of course, a common activity. I joined an afternoon boat trip to the now-uninhabited Shiant Isles, located four miles south-east of Lewis. Experiencing a familiar landscape from an unfamiliar vantage point, not to mention watching thousands of puffins and guillemots dive into clear waters, filled me with awe. But while natural landscapes can make us happier, I knew from experience that they aren’t always as beautiful as they are on these summer days. When that scenery is hidden by rain, the winter days are long and dark and the wind can reach 100 miles-per-hour, what else keeps people in the Outer Hebrides happy? “It’s the people,” insisted Donald Macsween, a crofter and broadcaster from Lewis. “I enjoy nipping to the shop and having a yarn with everybody that’s there, and when you do communal activities … it’s a good laugh. Every community needs social hubs. We’ve got quite a few here and every community in the Western Isles will have their own.” Macsween has lived here all his life. He regularly visits Glasgow, where he attended university, but is always happy to return to the islands. “It’s the people that keep me here,” he said. I understood. I thought of the old friends I’d sat talking late into the night with earlier that week; the neighbors who’d known me since childhood; the distant relatives I’d bumped into in the supermarket. I knew exactly what Macsween was talking about. When it comes to our sense of well-being, research confirms the importance of these kinds of social ties. “A sense of community belonging has the largest impact in explaining inter-community differences in average life satisfaction,” explained economist John F Helliwell, professor emeritus at the University of British Columbia. His research in Canada has found that smaller communities have, on average, a higher sense of community belonging, higher levels of trust in neighbors and more time spent with family and friends. No one I spoke to was surprised. As my Hebridean summer came to an end and I boarded the first of four flights that would take me to my adopted home, Macleod’s words lingered in my mind. As I watched the moorland, lochs and beaches disappear beneath the clouds, I knew she was right. We carry the place with us wherever we go, near or far. With a connection to people and place that deep, it’s no wonder the Outer Hebrides is one of the happiest places in Britain. Source: Kathryn Macleod, BBC, September 5, 2017. I thought that everybody knew that people are happier in country locations where they aren't living on top of each other. Well, they don't have to deal with traffic, probably don't have rude people, congested sidewalks, nosy, loud neighbors, pollution, and all the other stuff we city folks have to deal with. I know I am happier when I can spend a few hours outdoors in a remote park and not hear cars, people honking, and feel the stress or pressure of having to be around jumpy people, deadlines, and other annoyances. Doesn't seem too hard to figure out that stressed people feel so much happier after a quiet park picnic, a weekend camping, or anywhere else where they are not surrounded by people or noise.